The first time I saw a set of carpet bowls was in an antique shop in Edinburgh, not long after I’d moved to Scotland to study ceramics at Edinburgh College of Art. Prettily patterned and coloured, some in pristine condition, others dinted and chipped through years of use and play, these typically Scottish ceramic toys caught my eye and stuck in my memory. An invitation from FCA&C to take up one of the Fife Coastal Path Residencies has brought that memory back into sharp focus and inspired an idea to make contemporary versions of the carpet bowls. Buckhaven Community Centre is an ideal location for the project, boasting the fantastic resource of a community pottery, ably run by Donald McIntyre. It is a busy and friendly space open to all and Donald is always on hand to offer expert advise to anyone wanting to try their hand at making something in clay. Regular users of the pottery Gareth Baglow and Christine Flynn along with members of the local residents group CLEAR (Community-Led Environmental Action for Regeneration) Marion Garry and Liz Houston are giving up their time and ideas to supporting the residency, collaborating with me to design and make the contemporary carpet bowls. We have decided to call the project ‘Buckhind Braes Baws’. ‘Buckhind’ because that’s the local name for Buckhaven, ‘Braes’ because it’s the local name for the Buckhaven stretch of the coastal path, and ‘Baws’ …. hopefully needs no explanation! 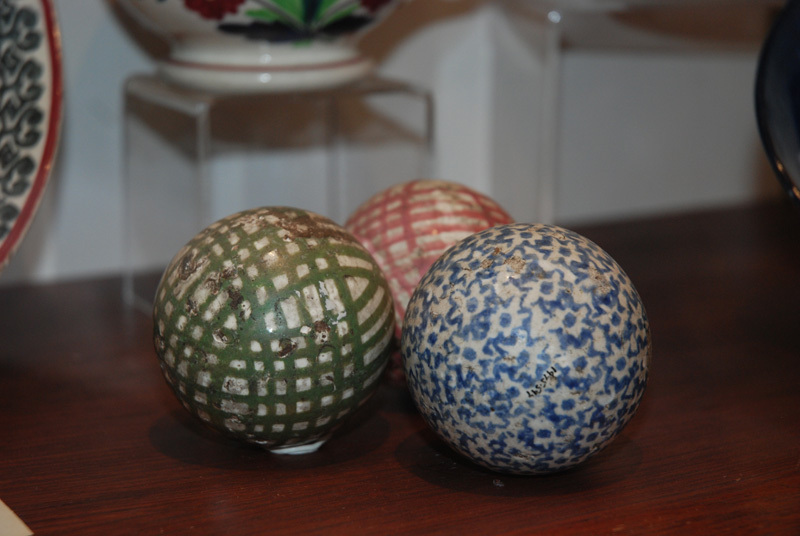 So far our research has taken us to; Kirkcaldy Museum, where the museum curator Jane Freel gave us a guided tour of the historical ceramic collections which include a well used set of carpet bowls produced at the Kirckaldy pottery David Methvens. A damp and misty Buckhaven Harbour where we explored the rock pools and watched the sea birds with Fife coastal path ranger Stewart Bonar. A tour of Wemyss Ware Pottery Studio in Ceres, where founder Griselda Hill shared with us the history of Wemyss Ware and her studio. My own work space at Edinburgh Ceramic Studio, in Coburg House Art Studios in Leith, where we met with my fellow studio holders and worked in the education space making plaster moulds that we will use to make the carpet bowls. Thank you to everyone who has helped in our research so far and in particular to Paul Gow at Highland Stoneware who has generously shared his knowledge and expertise, offering invaluable advise on the tricky technical problems of making and decorating the carpet bowls. I will next be at Buckhaven Community Centre on Thursday 30th September from 9.30 – 4pm for a day of drawing and developing pattern designs. Anyone interested in coming along to see the work in progress, or even to contribute a few ideas, will find us downstairs, next door to the pottery. All visitors should sign in at the reception desk first. Project looks fascinating and really looking forward to seeing designs that develop on 30th! Can I order a set now? Yes, we could re-start the fashion for carpet bowling (with arty bowls!) in Fife – particularly good as we move into autumn/winter! I remember seeing large bowls of them decorating people’s houses as a kid, but didn’t realise what they were…always fancied a set. As soon as we have our designs finalised we’ll let you know and you can pick your favourite. Our first order – Thank you! Looks like a game that could migrate across the border – please let me see the finished designs. Shame that we’ll soon have no carpets! These are really lovely and I can’t wait to see the new designs! Really interesting project . We regularly walk bits of the Coastal Path and you do find bits of pottery still in certain places (not to mention fossils and evidence of Fife’s coal mining past). Can anyone help identify where this bit might have been perhaps near the mouth of the Leven? Anyway we kept finding small weathered white chalky angled rods some with small projections at right angles at each end. Fascinating shapes some of them Thought they would make interesting brooches. It was not until we found one with three arms joining from a small central foot that we managed to “reconstruct ” in our heads what they were. Am sure they were broken ceramic tripod stands used to layer plates for firing in a kiln.